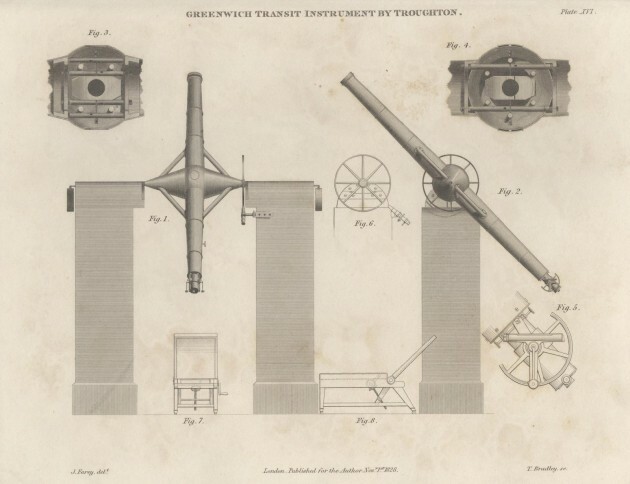 Erected in 1816, the Troughton 10-foot Transit Instrument was a replacement for Bradley’s 8-foot Transit Instrument of 1750. It was itself replaced by Airy’s Transit Circle in 1850. It defined the Greenwich Meridian from 1816 until 1850. Mounted in the plane of the meridian, the Troughton 10-foot Transit Instrument was used in conjunction with an accurate pendulum clock, to ascertain the right ascension of a heavenly body. This was done by measuring the (sidereal) time at which it transited (crossed) the meridian. Certain of the brighter stars, whose positions had been refined by repeated observation over a long period of time, were used as ‘clock stars’. By comparing their observed times of transit with their theoretical ones, the errors of the transit clock could be determined. Click here to read more about the astronomical basis of timekeeping. Constructed by Troughton, the overall dimensions of the telescope were determined by two factors. Firstly, It incorporated as its object-glass, a pre-existing achromatic lens that had been made by Peter Dollond. This belonged to a telescope acquired by Maskelyne for the Observatory in 1793 at a cost of £150 (RGO6/22/30). The object-glass dictated the length and aperture or the telescope. Secondly, the new instrument had to be capable of being mounted on the same piers as its predecessor, albeit raised in height. The length of the telescope is about 10 feet, and the clear aperture of the object-glass 5 inches. The length of the axis (between the extremities of the pivots) is 4 feet. Further details can be found in the contemporary accounts to which links are given below. Constructed in 1750, Bradley’s 8-foot Transit Instrument was gradually found to suffer from a number of problems. Originally made before the invention of the achromatic doublet, its Object-Glass was upgraded by Dollond in 1772. Although other modifications were also made, the issues arising as a result of its slender and feeble construction were difficult to quantify and remained unresolved. In 1792, Maskelyne proposed to the Visitors that a Meridian Circle might usefully replace both the Transit Instrument and the Quadrants (RGO6/22/28). Although the Visitors supported him, the proposal came to nothing. In 1806, Maskelyne proposed the acquisition of a Mural Circle by Troughton. This was supported by the Visitors at their meeting on 22 January 1897 (RS MS600/59 & RGO6/22/53). Approval for its acquisition was given by the Board of Ordnance on 23 March. Although conceived by Troughton as an instrument solely for measuring North Polar Distance (NPD), Maskelyne decided to ask for a number of additions, with a view to making it perform as a transit instrument capable of measuring right ascension as well. Maskelyne died in 1811, before the Mural Circle was delivered. His successor Pond brought it into use in June 1811. It soon became clear that whilst its performance in measuring NPD was superior to that of the quadrants, its performance in measuring right ascension was inferior to a conventional transit instrument. At the same time as he was assessing the properties of the Mural Circle Pond carried out a series of observations on circumpolar stars with the 8-foot instrument in order to better try and understand the nature of its imperfections. He reported his findings on both instruments in a paper that was included in the first volume of his published observations. Click here to read it. Having concluded that a new transit instrument was required, one was ordered from Troughton. According to Howse (1975), this was done in 1813. Neither Pond nor Airy wrote up an account of the instrument. Both referred readers to the description by Sir James South of his Transit Instrument which was published in a paper in the Philosophical Transactions of the Royal Society in 1826. South’s instrument was constructed by Troughton a few years after the Greenwich one. Despite its smaller size, it was implied by Pond to be identical ‘in every essential and peculiar part’. In 1829, William Pearson published a description of the Greenwich Instrument that drew heavily on the account that South had written. The figures in the plates accompanying the two accounts both carry the name T Bradley. He is credited with drawing them for South’s account and engraving them in Pearson’s. South’s account is accompanied by nine figures spread over three plates. Pearson’s has eight figures contained on just one. An introduction to practical astronomy Volume 2 pp.366–371. Rev. W. Pearson (London, 1829). Click here to view the accompanying Plate (Plate XVI), which is also reproduced above. An account of South’s instrument was also published in the seventh edition of Encyclopaedia Britannica in 1842, which is from where the engraving below is taken. Click here to read it as republished in the eighth edition. Click here for the plate (note the change in plate number from the image below). The account below was written by the Observatory’s First Assistant, Robert Main in 1850. Originally published in London and its Vicinity exhibited in 1851. The volume was republished the following year and again in 1854, but this time under the title: The Pictorial Handbook of London. 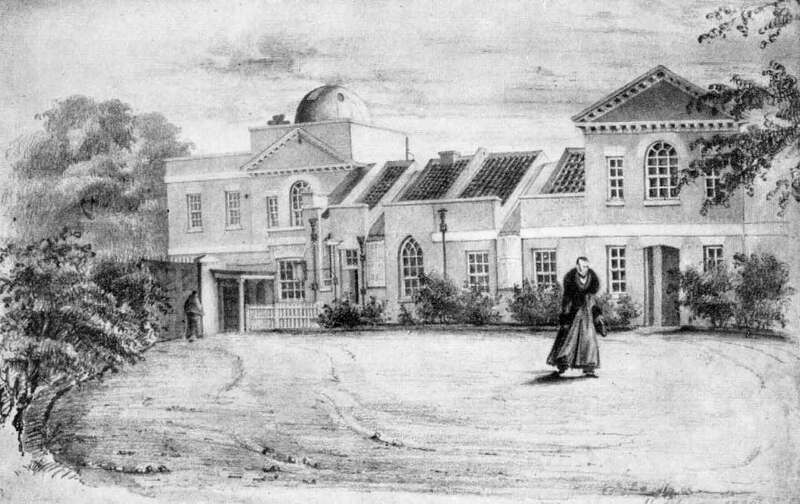 The Observatories of London and its vicinity. Robert Main. From London and its Vicinity exhibited in 1852, pp.647– 649 (John Wheale, London, 1852). The 10-foot Transit Instrument was used in the Transit Room in what is now known as the Meridian Building. It was positioned above exactly the same spot on the ground as the 8-foot Transit Instrument it was replacing. In what must have been an exceeding slick operation, the last observation was made with the 8-foot Transit Instrument on 15 July 1816. The following day the 8-foot Instrument was dismounted. To accommodate the extra length of the new instrument, semicircular caps 2 feet in diameter and 2 feet 3 inches wide were placed on top of the existing piers (whose dimensions were 2 feet square by 6 feet 2 inches high). As well as raising the height of the pier, the caps had the effect of narrowing the gap between them by 6 inches. 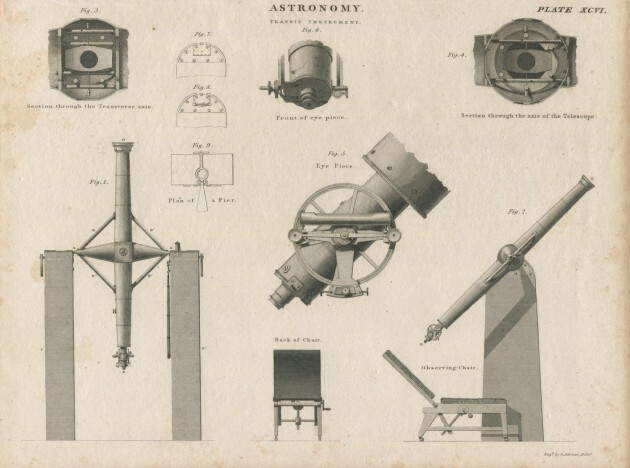 The first published observation with the 10-foot Transit is dated 21 July 1816, meaning that it took less than a week to get the new instrument installed and working. Click here to view the entry in the published observations. The telescope remained operational until the end of 1850. It was dismounted the following year and the room converted into an office for the Astronomer Royal. 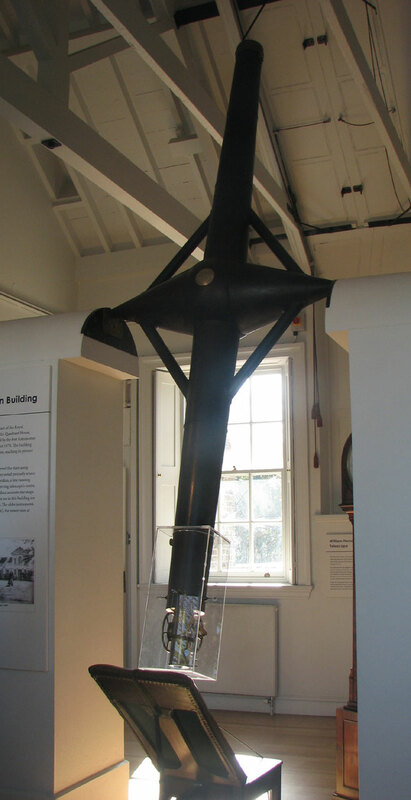 Initially the 10-foot Transit Instrument was used with the clock now known as ‘Graham 3’ which had been in the Transit Room since 1750. Meanwhile in the room next door, the Mural Circle was also being used for transit measurements with the clock ‘Hardy’ which had been specially commissioned for this purpose. On 10 September 1821 ‘Graham 3’ was replaced with a clock by Molyneux & Cope. 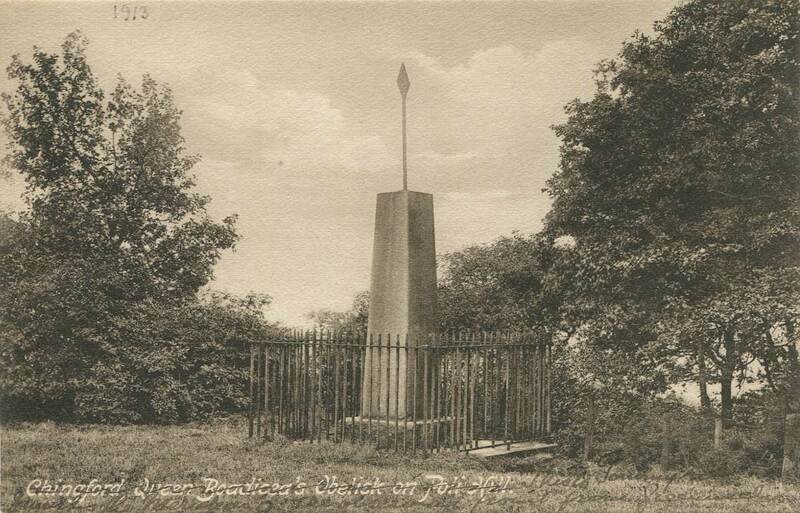 This was taken down on 24 November 1822 and replaced with one by Johnson which came into use on 28 November 1822. Transit measurements with the Mural Circle having been abandoned in 1819, the clock ‘Hardy’ was eventually moved to the Transit Room replacing ‘Johnson’ on 4 November 1823. The clocks were fixed to a pier, that had been originally set up for the earlier Transit Instrument. Their location to the south of the western pier was convenient for timing transits of stars culminating in the south. To enable the observer to see the clock when facing north with his back towards it, a hinged mirror attached to the western pier was provided. When the Airy Transit Circle replaced the 10-foot Transit in 1851, the clock ‘Hardy’ was moved to the Transit Circle Room for use with it. This involved setting the movement into the base of the pier of the southern collimator where it remains today. The clocks were regulated to sidereal time. It was from them that the mean solar time at Greenwich, i.e. Greenwich Mean Time, was ultimately determined. Until 1871, the Transit Clock was the de facto Time Standard for the Observatory and for much of the UK as well. The meridian of a transit telescope is established from observations of the circumpolar stars. These stars are always present in the sky and transit (pass over) the meridian twice each (sidereal) day as the Earth spins on its axis. When a transit telescope is correctly aligned, the measured time between successive transits of a given circumpolar star is constant. If a good catalogue was to hand, the right ascensions of a high and a low star could be used instead. Once a transit telescope had been adjusted to the meridian, it was possible to create a mark on the horizon for use as a quick alignment check. The standard way of checking the collimation (alignment of the optics) of a transit telescope prior to the introduction of collimators in the 19th century was to adjust the telescope to a distant point or mark on the horizon and then reverse it in its mountings. Other things being equal, if the optics were correctly aligned, the mark would still be seen in the centre of the field of view. Reversing the telescope was a time consuming and a potentially hazardous operation. Once a transit telescope had been initially collimated; provided correctly placed meridian marks were available to both the north and the south, there was no further need to reverse the telescope unless, when aligned to one mark, it was out of alignment with the other. By then reversing the telescope, it was possible to determine if the problem was one of collimation or a shifting of one or other of the marks. For his northern mark, Pond had a new mark set up at Blackwall at the time that the new telescope was brought into service. Erected in July 1816, it was located on the wall of an engine-house in the East India Docks, at the distance of 10,706 feet from the Observatory. Unfortunately it was often rendered invisible for a week or fortnight, and occasionally for a longer period, either by ships moored near the place in the direct line of vision, or by vapours arising from the River Thames, and the London smoke, especially during westerly winds. As a result, in the spring of 1824 Pond had a second North mark erected at Chingford, on the Essex hills, at the distance of nearly 11 miles. This took the form or a granite obelisk. ‘the engine-house being taken down about September 1833, a temporary mark was painted on the iron facing of the wharf of the said docks. Since which period, a large building, designed for a tavern, has been erected on the spot where the engine-house stood, about forty feet high, and which affords a great advantage for a new mark, the original one being only about fifteen feet high. A new mark on February 27 last, was fixed on the blocking course of the building: it consists of a thin iron plate, 19½ inches high and 12 inches broad; the middle is painted white, 5 inches broad, with a 3½ inch black border: it is secured to the blocking stone by four screws, the plate having grooves or slits to admit of a small adjustment’. In addition to the hazards encountered when reversing the telescope, Pond also found that the instrument, when restored to its former position, did not return exactly to the same place. As a result, he created a new south mark in the form of a collimator. This consisted of a five-feet telescope (probably one the Observatory already owned) which was mounted on a transit axis and furnished with a vertical wire in the principal focus. It was placed on Y’s (said to be those of the old 8-foot Transit instrument) in the south slit of the room. In use, the wire was made to bisect the north meridian mark. The operation of reversing the transit instrument was then largely dispensed with. The instrument was dismounted on 9 February 1825 in order for its pivots to be changed from bell-metal to steel. It was remounted on 18 May and brought back into use on 21 May. They were returned in 1832 and in 1849, were said to ‘never have deviated in their form from perfect circularity’. Having been superseded by the Airy Transit Circle in 1850, the telescope had no further practical use. In 1851, the object glass was removed and the telescope and axis was hung as a relic on the west wall of the new Transit Circle Room. The object glass was reused in Airy’s Reflex Zenith Tube and the old Transit Room converted into an office for the Astronomer Royal (no such office having previously existed). In 1852, the lifting apparatus was placed in the cellar below the Octagon Room staircase, which was almost certainly damp (RGO39/1/2). It was removed a few years later in 1856, when the cellar was commandeered by Airy as a space to store spare batteries for use with the newly installed galvanic time system. What happened to it after this is not presently known. When Flamsteed House was fully opened to the public for the first time in 1960, the instrument was put on display in the ‘Halley Gallery’ (which occupied the ground floor of Airy’s extension. It remained there until 1967 when it was erected on replica piers in its original position in the Meridian Building. It is still there today.